Brand success=business success. A simple equation, but as no two brands are the same, identifying what those winning qualities are is not easy. And given that the whole point of branding is to create a distinct identity, it’s absurd to look for a single magic formula. Brands discussed include IBM, Wal-Mart, McDonald’s, Nike, Starbucks, and Microsoft. 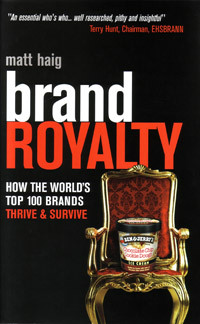 Chapter 5 from Brand Royalty by Matt Haig, ISBN: 978 0 7494 4826 4 published by Kogan Page, $19.95. Copyright Matt Haig, 2004. Reproduced by permission of Kogan Page. Visit Kogan Page for more details. Copyright © 2004, Matt Haig. All rights reserved.